“Every child is an artist. The problem is how to remain an artist once we grow up,” Picasso. All too often artists seem to fall into the trap of taking their work too seriously. If their watercolor painting doesn’t work they feel let down, if they don’t win a prize they feel they are not progressing, or that the judge picked the wrong painting. I was recently talking to one of my students about this problem when I realized that when I was a child, and when I have observed children play with their paints, they never sit there and say look how terrible this is, or that they are not progressing with their work. No, a child just has fun painting. They are happy with every one of their creations, weather each drawing or painting is the same or quite unique. My youngest son, when he was about 4 years old, started drawing a particular bird. He must have drawn the same one, with small changes in color, about 50 times. He loved everyone and would run in to show us each one. He was just enjoying drawing his birds. I had one student who painted this way. He had a very highly stressful internet technology job but when he came to class he just had fun. He was not trying to create masterpieces, even though he did create some nice work, he just loved painting with watercolors. I don’t think I ever heard him complain about any of his works, even the ones which obviously didn’t work. This is a great state to be in as an artist. The more serious things become the less we get out of it in the end. So enjoy your painting, have fun, and you will no doubt be surprised with what you create. If you find yourself getting serious about your watercolor painting, just tell yourself you are going to spend a few sheets of watercolor paper just playing, then see how you feel. Just throw the paint around, see how the watercolor paints flow into one another on you wet paper, see how different colors mix, etc. You are just playing, with no end product in mind. Enjoy yourself when you paint watercolors! The very first time I tried watercolors I asked my teacher what should I do. He said just wet the paper and play with them. I did, and still have that little painting today. 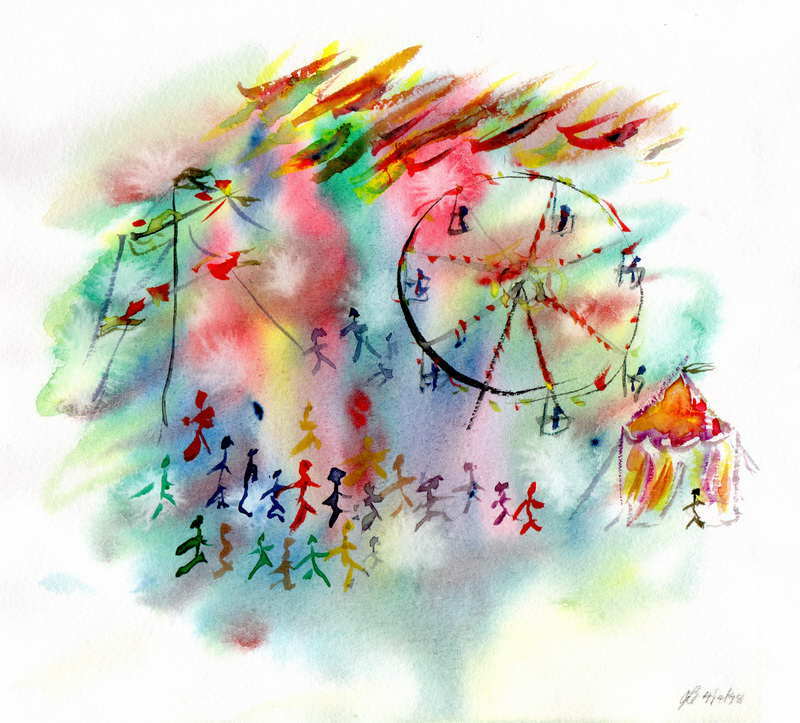 Just playing -have fun when you paint watercolors.